CANTON, MA (April 10, 2013) -- Dunkin’ Donuts, America’s all-day, everyday stop for coffee and baked goods, is putting hot tea in the spotlight this spring. Dunkin’ Donuts today unveiled a new look for its packaged hot tea, featuring a new design with more vibrant, modernized graphics. 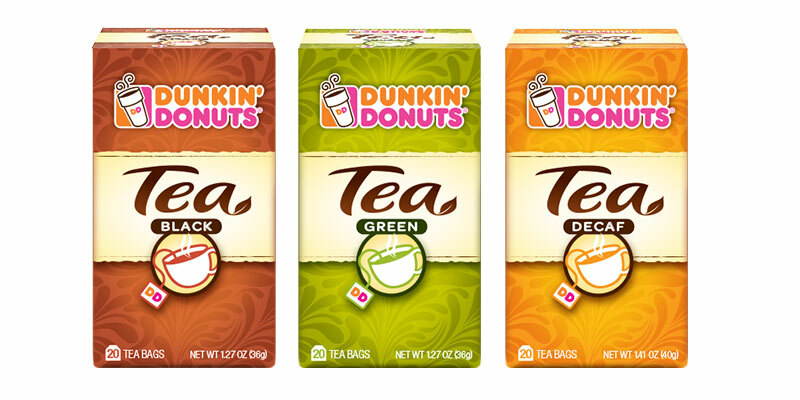 The new boxes of packaged tea, available in black, decaf and green varieties, will be arriving at participating Dunkin’ Donuts restaurants nationwide beginning today, for a suggested retail price of $5.99 for a 20-count box. This year marks the 10th anniversary of the introduction of Dunkin’ Donuts’ signature hot tea, a proprietary blend of select high grown teas for high quality and taste. Dunkin’ Donuts’ traditional black tea is a well-balanced, bright and flavorful tea with an attractive amber color and a brisk taste. Dunkin’ Donuts’ green tea has a bright and verdant flavor with toasty top notes. All of the farms from which Dunkin’ Donuts sources its tea are members of the Ethical Tea Partnership, a not-for-profit organization established in 1997 to help build a thriving tea industry that is socially just and environmentally sustainable. Dunkin’ Donuts teas are sourced by a member of the Ethical Tea Partnership to support the organization’s efforts to improve tea farmers' lives and environment, and ensure a sustainable tea supply for the future.